This was perhaps one of the best Palm Springs Desert Classic tournament weather-wise in a long time. Three days of perfect 70 degree weather and great competition made it a super weekend. It was a testament to the level of competition in the 60+ with two teams going 3-0 and the remaining six teams all going 1 – 2. All teams were in it until the end. This was our second year in a row to win the 60’s and I believe we have won the tournament five out of the last six years. 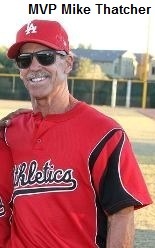 We were able to achieve success as a result of a large roster that was extremely deep in pitching. I brought 10 legitimate pitchers and three never saw an inning on the mound. The 2 1/2 hour time limit on games, and the fact we didn’t have a playoff game, obviously helped but made things difficult for me as a manager. 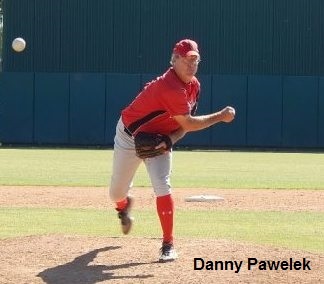 In the championship game against the So Cal Angels, Danny “The Beast” Pawelek threw seven strong innings and did not yield a run. 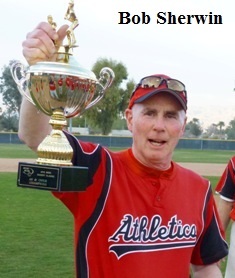 He gave way to Joe Whitmer in the eighth and Bill Brown in the ninth. Second baseman Kevin Bronson and third baseman Paul McPherson were not just flawless in the field but made spectacular plays as well, as they supported the ‘Beast’ in his win. Offensively, we were led by Mike Thatcher, the Beast, Mike Livesey, Blaine Olson and yours truly (Sherwin) with two singles and two RBIs. Our MVP awards went to Thatcher, who reached base 15 out of 16 times in the tournament, along with McPherson and Bronson for their stellar defense in all four games. Pitching stars for us in the tournament were the Beast, Joe Whitmer, Mike Livesey, Mike Patrick, Jon Scheuerman, Bill Brown and Eddie Delzer.